I am given to understand that the parents on this photograph kept trying till they got their heart’s desire of two sons. That reminded me of my parents’ desire to keep trying till they got a daughter. The next photograph is circa 1967 when all the siblings were still single. 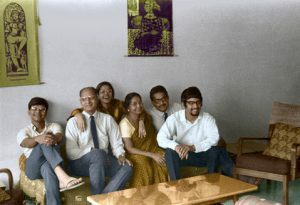 From left to right Arvind the son my parents got immediately after me, our father, Padmini the daughter that they kept trying for, our mother, yours truly and Barath the number three of the family. Three brothers and a sister finally and you can imagine what a privileged position that is to be! I have always told Arvind that life for the two of us would have been very different had he been born a girl! Between the four siblings we produced five boys and three girls! I shall save a post for those eight for another day. Fast forward circa end 2012 when the four of us siblings got together again at Chennai where Arvind and Padmini have settled down. From left to right, Arvind, Barath, yours truly and Padmini. Not a great photograph but enough to show that the fourth generation, ie the grand children of the siblings have come into the scene. 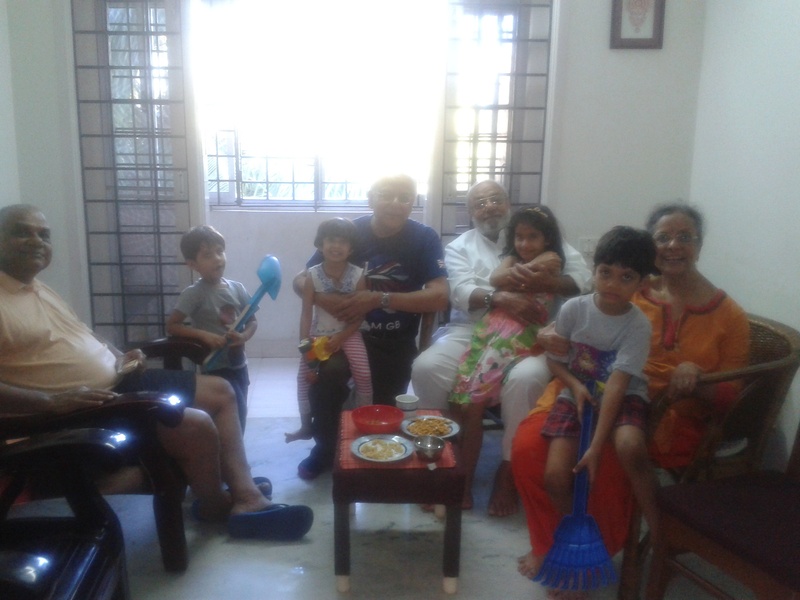 Six grand children are missing, being in the UK, Bangalore and in Delhi. Four boys and two girls away, leaving two boys and two girls with us at the reunion. Totally six boys and four girls. Two children, my son Ranjan and Padmini’s daughter Nitila have no children. The ratio has improved but still not the ideal fifty-fifty, but I don’t think that there is any scope for that in the future. When the whole family including all the sons and daughters in law and all the grandchildren get together again, I hope soon, I shall write again with photographs. This entry was posted in Family, Relationships and tagged Gender ratios. Bookmark the permalink. Gosh, yes, the holy grail for some. THE SON. THE DAUGHTER. THE OTHER. THE ONE YOU HAVEN’T GOT YET. One of my sisters had four sons. She didn’t give up. Her husband didn’t either. Number FIVE was a daughter. Thank god. Otherwise my sister’s genes would have multiplied to infinity. I like the phenomenon being called the holy grail Ursula. We got one of each in only two tries. Believe me – two was and is sufficient – LOL. I had 2 brothers and one sister, one of the brothers died before he was one. One of my best childhood pals in Colorado came from a large family – 7 or 8 kids. In our case, we were advised not to have any more children after Ranjan was born and so we did not. I have no regrets and I quite enjoy my nephews, nieces and grand ones too. Inshahallah, we’ll have that entire family photograph very soon. तुम्हारे मूह मे घी शक्कर! WOW. you were a handsome devil and still are! and padmini has not changed at all. still smiling that beautiful smile! i think coming from a large family would be fun. it’s just the marine and me. and his only son and wife and their two boys. when we’re all together it’s 6 of us total! Thank you Tammy. Considering the norms of those days, our family would not be called a large one. In fact, it was much later that the norm of “We Two Ours Two” came into being over here. 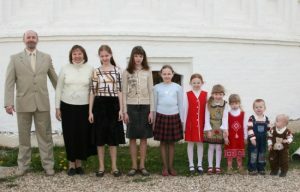 Karen is the third oldest in her family — two older sisters — and, after Karen, there were eight brothers. The twelfth was a girl… and, boy, was she spoiled. I’m the oldest of six. My mom only had two and I never really knew my 4 younger half-siblings as they, for the most part, grew up in California and Oregon, while I was in Nebraska and Texas. The six of us have never been together at the same time. Either my sister or I have been the missing one in the few times that five of us “met up.” The four youngest all live in Oregon. My other sister lives in Indiana and I live in Arkansas. Both of you come from large families but like many here too, living apart in different parts of the country as well as the world, getting together is becoming more and more difficult. That is a fair sized family and the grandpups makes all the difference! We got a wonderful son on the first try, and often point out: “Once you get it right, there’s no need to try for more.” Of course, we really don’t mean that. You are a lucky man to have such a fine family. So did we and we were medically advised not to have any more. Our only child Ranjan has grown to be a fine man too. I am indeed blessed. Thank you. Only some communities in India are afraid to produce daughters because of various social problems, primary one being the institution of dowry. The majority do not have any problems with daughters but the media being what it is, highlights female foeticide, infanticide etc to sell their wares. Thanks for that. You’re right, media tends to only focus on the worst of things. You seem to have done well for all that.